Both Jorge Lorenzo and Marc Marquez were lucky to get away with a huge moment in the final stages of last Sunday’s MotoGP race at Mugello, after a tiny mistake from Lorenzo on the last lap left the two in collision at over 200mph on Mugello’s ferocious main straight. “At the end of a straight normally you put your foot on the gear level before closing the throttle so you can shift down as you throttle off. 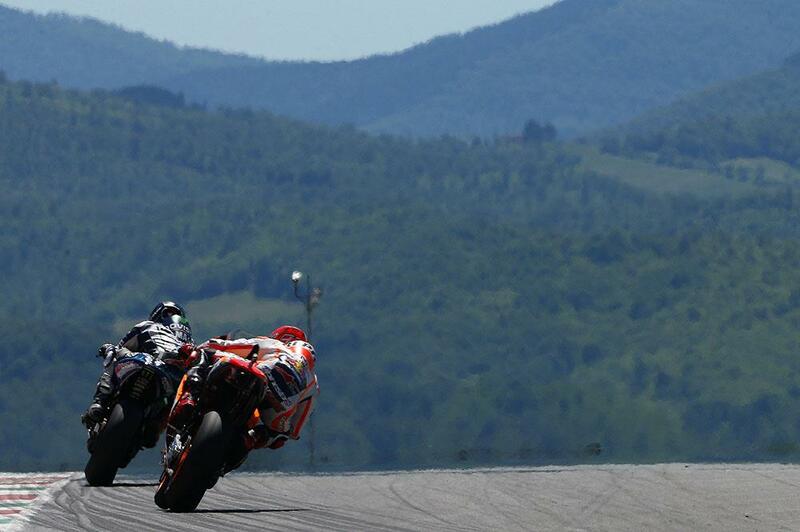 But you can’t do that in Mugello, because the force as you brake forces your foot to change down too early. However, Marquez was quick to laugh off the moment in his typical form – even as he admitted that it could have been much worse. “From behind, it was a little bit more scary! I was pushing my bike in the slipstream because I was struggling with the speed – then suddenly I saw Lorenzo’s bike stop!